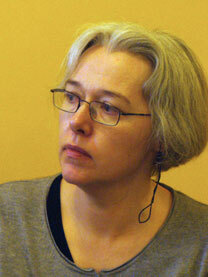 Above: Susanna Clarke, being interviewed by British fantasy author Juliet E. McKenna: March 11, 2006. Image © Patrick Nielsen Hayden. Used under Creative Commons license. Elizabeth Hoiem (hoiem@uiuc.edu) is an English graduate student at the University of Illinois, Urbana-Champaign, where she teaches fantasy and British literature. She is writing her dissertation on autonomy and mechanism in British education theory, 1760-1860. This project occasionally clashes with reading speculative fiction, but the two fields find common ground in her love of quirky mechanical gadgets. Her other writing includes an article in Tolkien Studies , Volume 2. To the right, she is seen with her cat Pippin.